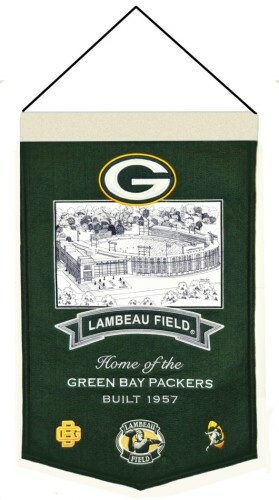 This Green Bay Packers Lambeau Field Wool Stadium Banner is constructed of high quality wool fabric with embroidery and appliqu� detail. Each banner features the team�s stadium illustration and team graphics. It includes a hanging cord for display. 20" high and 15" wide.